There’s hardly a person worldwide who hasn’t heard of Darwin the Ikea monkey. 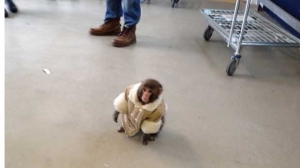 A couple of weeks ago, Darwin, a rhesus monkey, was found wandering outside an Ikea store in Toronto wearing a sherling coat to keep him warm. Within an hour Darwin became a social media sensation, trending on Twitter and two help Darwin accounts – @ikeamonkey and @ikea_monkey. That got the attention of major news organizations around the world, including fashion reporters who discussed whether Darwin’s sherling coat was real or synthetic. Darwin may only have 7,830 follower but six days later people are still tweeting about him. Who doesn’t love videos of animals and babies? Puppies playing and babies laughing get countless millions of views. My Facebook page is dominated by my friends cat pictures. I fight back with pictures of my horse. So it’s no surprise that 1 in 10 pets have social media accounts. There are 16 million cats and dogs in the U.S. and a whopping 164 million pets in the UK, according to the Social Petworking Stars infographic produced by SPANA (the Society for the Protection of Animals Abroad). Click here to see the full infographic. @common_squirrel puts out attention grabbing one word tweets: acorn, sleep, stare and hop. That’s garnered it 85,000 followers. Bizkit the sleepwalking dog has 47,712,493 million views on YouTube, up several million since Social Petworking Stars was released weeks ago. Social media has been very beneficial to organizations like SPANA, and it has grabbed the attention of millions around issues of animal welfare. SPANA created the humorous Social Petworking Stars infographic to gain awareness for its work with animals in Africa and the Middle East. Facebook pages have played a major role in re-uniting families with their pets in the aftermath of disasters like Hurricanes Katrina and Sandy. There’s no official estimate of how many animals were affected by Sandy but more than 250,00 were displaced by Hurricane Katrina in 2005. Humane societies use networks like Facebook, Pinterest and YouTube to find new homes for their dogs and cats. A friend of mine told me last week that she was re-united with her cat two years after she was lost when she saw the cat’s picture on her local humane society Facebook page.